Alexander von Zemlinsky’s two one-act operas based on Oscar Wilde, Der Zwerg (The Dwarf) and Eine florentinische Tragödie (A Florentine Tragedy) are occasionally performed with other partners (Puccini’s Gianni Schicchi makes an apt comic foil for the latter) or even singly (The Dwarf is 90 minutes on its own). But ever since they were twinned in early productions in the 1920s they have more often than not appeared as a double bill. The novelty of Theater Lübeck’s staging is to reverse the usual order of presentation. The Florentine Tragedy is a torrid, fast-moving rush of emotion giving the sense of a 50-minute prelude to something else; The Dwarf, on the other hand, although with a tragic outcome, is more varied, with moments of light as well as shade and feels a more substantial and nuanced piece – the meat of the evening as it were. Director Bernd Reiner Krieger’s reason for reversing this traditional running order is to draw links between the lead characters in each opera with Zemlinsky himself and his pivotal affair with Alma Schindler. For her later marital exploits I refer readers to the Tom Lehrer song to be reminded of the extent to which this femme fatale carved an emotional swathe through the artistic community of early 20th-century Vienna. In Zemlinsky’s case, she was his composition pupil between 1897 and 1901 and his lover until her marriage-at-first-sight encounter with Gustav Mahler in 1902. Zemlinsky was no Adonis, and Alma is quoted as stating it was his mind that fascinated her (not that that apparently stopped her praising his ‘virtuoso hands’). 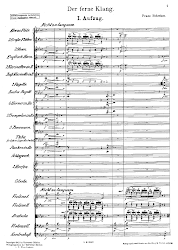 The break-up in favour of Mahler appears to have affected Zemlinsky deeply and 20 years later his Lyric Symphony – an orchestral song-cycle – was still dealing with the subject of love won and lost. In the meantime, he had asked his friend and fellow composer Franz Schreker (in honour of whose first successful opera, Der ferne Klang – The Distant Sound – this blog is entitled, incidentally) to write him an opera libretto on the subject of ‘the tragedy of the ugly man’. Both composers evidently had problems with self-image. Ultimately, and with Zemlinsky’s acquiescence, Schreker decided to set this libretto himself, as Der Gezeichneten (The Marked Ones), about a deformed Genoese nobleman’s forelorn attempts to find love and acceptance. Instead, Zemlinsky turned to an Oscar Wilde story that coincidentally Schreker had already set as a ballet, The Birthday of the Infanta. Inspired by Velázquez’s painting Las meninas, showing the Spanish Infanta with two dwarves, Wilde’s tale tells of the princess’s birthday party and of a sultan’s gift of a dwarf as a present. The dwarf has never seen himself and doesn’t know how ugly he is – the infanta and her friends play along with his self-delusion that he is a handsome knight and he falls headlong in love with her. But the infanta’s maid shows him a mirror and when he realises the truth about his appearance he dies of a broken heart and the princess’s childish response is essentially ‘oh dear, my toy has broken’ and she returns to her party. In many ways, the tragedy of the dwarf’s fate, rejected by an unthinking, spoilt child when his usefulness is past, is greater and more heart-rending than that of the other opera where ‘tragedy’ is in the title. Here, in a work written a few years earlier under the unmistakeable musical spell of Strauss’s Salome and Elektra, Zemlinsky sets a version of Wilde’s unfinished play A Florentine Tragedy, in which a merchant comes home one day to find his wife in the arms of a lover – the Prince of Florence, no less. Rather than confront them immediately, he doesn’t let slip that he has seen them and acts the host, inviting the prince to dinner. He eventually rises to the bait of their flirting, the two men fight and the prince is fatally stabbed. In a moment of transformation, the wife, who moments ago had been goading her lover to kill her hateful husband, realises her admiration for her husband’s strength and he in turn expresses his appreciation of her beauty. Given these two plots, it might seem implausible that they can be made to reflect the affair between Zemlinsky and Alma with any kind of realism or that they can be made to intertwine in any meaningful way, but Krieger’s conception picks up on the emotional resonances more than the history. At the very start, a likeness of Zemlinsky is seen at the piano in embrace with a woman whom we take to be Alma (incidentally, the programme booklet gives no visual reference to the composer or his lover’s appearance, purely production photographs, so many in the audience will have had no reason to make the connection). 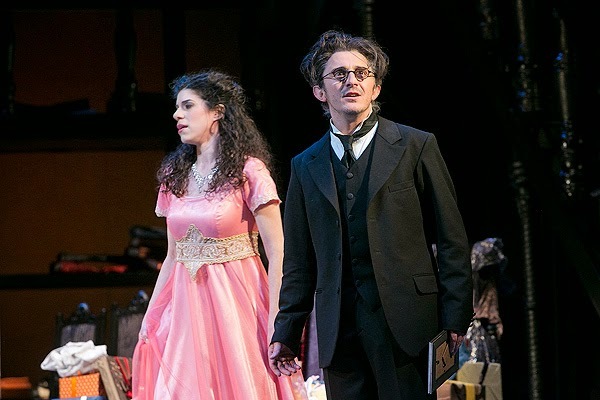 As she tears herself away, ‘Zemlinsky’ is left composing at the piano and the staging begins to take on a natural, uncomplicated approach to the portrayal of Wilde’s story. The princess, when she appears wearing a trademark pink dress, is obviously the Alma figure from the opening and the dwarf, when he is carried on in a cage-like litter, the composer. His piano becomes the support for both the Infanta’s throne and for the mirror that it encases. The denouement is witnessed by an older Zemlinsky-lookalike from the top of the grand staircase at one side of Roy Spahn’s solid, baronial single set. 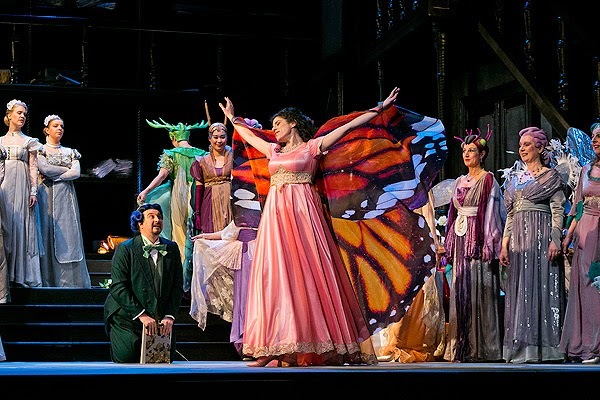 After the interval he is revealed to be Simone the merchant, and his wife Bianca, wearing a dress in telltale pink, is a kind of grown-up version of the princess in the first opera. Here is the reasoning behind Krieger’s ordering of the two works as a kind of generational progression – this time the ‘dwarf’ Zemlinsky is there to witness this opera’s conclusion and the whole seems to come full circle. We are not led to believe that we are seeing Alma as either a spoilt princess or an adulterous wife (she was certainly the latter, but it didn’t result in murder), yet the resonances between life and fiction are telling. Rejection, self-delusion are all there in both. This linking of the two operas really works in this context, and Wilde’s own ideas in the textual adaptations of George C. Klaren (Zwerg) and Zemlinsky (Tragödie) have more connections than are at first apparent – the concepts of hate or hatefulness and love and beauty, for instance: almost the last words of Der Zwerg are Ghita the maid singing to the dying dwarf ‘What a shame. God has broken a poor heart – it was beautiful’ and the last of Eine florentinische Tragödie are Simone singing to Bianca ‘Why did I never realise that you were so beautiful?’. Themes of self-knowledge are also common to both – the dwarf not knowing the truth about his appearance (and the Infanta’s lack of understanding that it is a human being that she is treating like a toy) as much as the Florentine wife only finally appreciating the strength that she so admires in her husband. Performances, as one has come expect in this richly endowed company, were exemplary. It was a shame that a vocal problem meant that Fulvio Oberto was unable to sing the title role of The Dwarf for this second performance in the run, but he acted the part with great passion and commitment and was ably ‘dubbed’ by American tenor Erik Fulton giving a powerfully lyrical performance from a music stand at the side of the stage (Fulton had taken the role in last year’s production in Nancy). Israeli soprano Noa Danon, a guest from Magdeburg Opera, brought appropriate naivety and petulance to the 18-year-old birthday girl and her singing revealed a well-coloured, light but warm voice. Best among the smaller roles was the Ghita of Evmorfia Metaxaki, a recent addition to Lübeck’s house ensemble and a soprano with a particularly rich timbre and expressiveness. 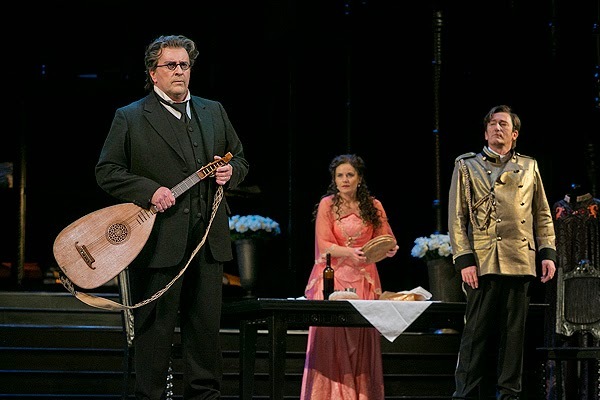 Taras Konoshchenko’s Don Estoban looked too similar to the Go Compare tenor for comfort, but this Ukrainian bass had spirit and sonorousness aplenty. The three-hander of the Florentine Tragedy was particularly well cast, with two of the theatre’s key ensemble figures as the husband and wife, Scottish baritone Gerard Quinn and Polish mezzo Wioletta Hebrowska, both of whom gave performances worthy of any world-class theatre. Guest tenor Wolfgang Schwaninger made the most of a rather unsympathetic character – or at least his princely haughtiness in this staging made his murder appear less a tragedy than a misfortune. Lübeck’s general music director Ryusuke Numajiri seemed better attuned in his conducting to the flightier, transparent sound-world of Der Zwerg than the heavier, more Elektra-like emotional rollercoaster of its companion, which needed a bit more space for the textures to breathe. But the orchestra – spilling out into adjacent boxes to accommodate Zemlinsky’s typically late-Romantic requirements – played magnificently and capped a splendid achievement for the company as a whole. POSTSCRIPT November 2014: Belatedly reading Marc D. Moskovitz's fine biography, Alexander Zemlinsky: A Lyric Symphony, makes me wonder if the Simone was not meant to be Mahler with Guido as Walter Gropius, whose affair with Alma may well have precipitated Mahler's demise. Alma hated the opera when she first saw it Vienna in 1917, partly, Moskovitz surmises, because she may have seen that affair reflected in its plot.